Well here's a dilemma and a half. Does he love her, does he not? Well, he cares about her at least, folks. Unfortunately, as the beautiful Carmella points out, that wasn't the question Oliver. Well, by not answering her question we can all assume, as does Carmella, that no – he doesn't love her. She yells at him to leave, and after refusing he eventually leaves. This leaves us with a crying Carmella who, well, cries to the dramatically sad music. Rosie gets off her mobile to Carmella and leaves. Toadie and Steph get ready to go and Toadie picks up a lot of papers. Steph can't believe he's bring it all home – she's cooked dinner Toadie! You can't bring all those home when she's cooked. Toadie says Rosie is with Carmella this evening so he has to do it all. Steph grabs another pile of papers and off they go. Rosie is playing with Carmella's hair – who isn't crying anymore! Rosie goes to get Oliver who is outside. Oliver walks into the room very slowly, but it's OK – Carmella says she's done her crying. Oh good, folks! 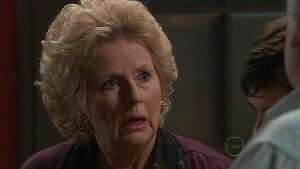 Rosie stands at the door looking mean whilst Carmella tells Oliver they need to think of the baby. Carmella is adamant they need to be ready. CARMELLA: The baby is coming and we need to be ready for her. Oliver demands time to think, at least until Carmella's out of hospital – I'm not sure what he has to think about but they agree to discuss whatever it is at a later date. Carmella wants their daughter to have a strong bond with both of them and she wouldn't deny Oliver that. Zeke and Valda are looking at a website where everyone says they've been scammed by Retail Dreams. Valda is annoyed she didn't look it up first – but Zeke tries to look on the bright side Valda is not alone! Lou comes up behind them and asks what they're doing to which Zeke covers for Valda about her helping him with his homework. Lou has a moan about Retail Dreams and Valda says she's going to see Jude soon and will raise the issue. Lou wants to come but Valda gets stroppy and Lou lets her handle it. He leaves Valda and Zeke. Valda thanks Zeke for covering and gets all teary saying she wants a hole to hideaway in. She looks like she's about to cry, and Zeke sits there, doing nothing about it. Janae comments on the guinea pigs at the table and then notices Didge is in her uniform – it's her first day back! Janae thinks life is too short for double maths and Didge agrees. Quite an odd moment! Janae leaves and Riley reminds Didge she doesn't have to push anything. Enter Steve and Miranda who fuss over Didge. Miranda asks if she'll be alright with “you know”. Didge says she has no problem with Susan – only Miranda does. Rosie is helping Carmella to back her things for home and offers that Carmella stay with her and Frazer. Carmella declines she needs her space – but not to think of Oliver. To prove this point she removes a picture of her and Oliver together screws it up and throws it in the bin. Her and Rosie laugh. Ringo is signing up to the Swimming Gala. Declan thinks that he's just doing to impress the girls in his “budgy-spugglers”? That's what it sounds like anyway. However, Ringo point out that it's actually the same day as their geography test – Declan hastily signs up. Jessica and Taylah approach and comment on Declan swimming. RINGO: He doesn't. He just wants to strut around the pool and impress you guys in his budgy-spugglers. Declan throws a pen a him and tells him to get his own work. Zeke joins them and then they all see Didge walking up the corridor and say hello. Didge asks for the gossip, but there isn't any. Apart from Sarah got suspended for smoking. To which Didge replies “She's out of control!” Oh Didge, how little you know, how little you know. Susan comes in and tells everyone to be quiet. To her surprise, they are. But when she turns around she sees it's because of Didge and not because she told them too. She tells Didge she'll catch her up on work she's missed in a minute, and then Declan gives up his seat for her without looking or really talking to her. Didge tells him to look at her and he does – but only because she made him. Hold your breath because comes a dramatic speech! DIDGE: No it's not! People can stop acting weird around me: staring, and whispering, and talking behind my back (cue guilty looks from Jessica and Taylah). You can just say it to my face. If you have a question about the accident then just ask me now and we can all get over it. The room is silent, but Ringo pluck up the courage to ask Didge if her walking aid comes in different colours. Ha, funny Ringo! They all laugh and Didge encourage anyone else to speak. Susan looks on admiringly in a way only Susan can do. Harold remarks on the 5 cups of coffee Valda has had – needless to say she doesn't care and orders another one because she didn't sleep last night. Harold says that won't help her sleep tonight and asks what's wrong. Valda, very wittily, replies that the bed-sheets were scratchy. Frazer and Oliver come in and sit down. They're talking about Carmella. 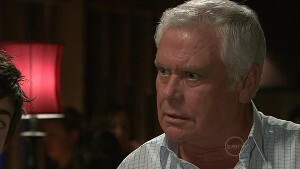 Harold comes over and takes their orders and then they continue to talk – Oliver explains that he couldn't lie to her. Back to our one and only classroom set and Didge is at the front of the class talking to everyone about the accident and the coma. Susan is watching on in the background looking a bit guilty. Didge apologises for taking over the lesson but Susan says it's important. Didge asks for more questions and Declan asks if she's angry with anyone. Susan interrupts, but Declan says he's not talking about her. Didge explains that anger doesn't change things, but she was scared so if anyone thought she was angry she just didn't have the guts to speak to them. Declan and Didge look at each other for a long time. Valda is trying to get $25,000 out of her bank account. She's getting teary again. She thanks them and goes. Steph asks if she's OK and Valda makes an excuse about being put on hold. Rosie, Toadie and Frazer are waiting for Catherine. Rosie isn't impressed that they have to shout Catherine lunch when she earns so much money. Toadie orders her to be nice. Catherine comes out of the office and asks Frazer to put her bag in the boot. Rosie tells Catherine that this is Frazer her husband and Catherine seems quite surprised and apologises. CATHERINE: I'm sorry, I just assumed. But Rosie can't help herself. Oh girl, are you gonna regret this! ROSIE: Hang on on. What was it you assumed, Catherine? CATHERINE: I beg your pardon? ROSIE: Well, you just said you assumed. I'm wondering what it was – that my husband wouldn't be a lowly taxi driver? Frazer tries to interrupt Rosie but she's in full steam! ROSIE: Ever since you arrived you've been looking you nose down at me. CATHERINE: You want to know what's going on here? Why you're so sensitive and why you're (talking to Toadie) beside yourself with stress? Why there is so much tension in this office? Because you know you can't win. You're in denial but if you took a step back you'd see beyond a shadow of a doubt – Ms Kinski is going to jail. Toadie steps in here and defends Susan and assures Catherine that they will win – and they odon't want an attitude like hers holding them back. Oooooh…fight fight fight! Unfortunately not – as a barrister she's very good with words and decides to leave and wishes them good luck which is clearly not meant. Toadie turns to face Rosie (he was standing infront of her all protective – quite sweet really). He sarcastically thanks her for her good work. Rosie reminds him that he's the one that just sacked Catherine. TOADIE: Yeah, you want to know why? Cos everything that you do reflects on both of us: on our clients, on our families. Your inability to act professional and keep your mouth shut could cost Susan everything! So yeah Rosie, great work! I would like to add I'm very disappointed Frazer just stood there and let his wife take all that. Rosie gets a phone call from Carmella and leaves. Valda gives Lou a cheque – a refund from Retail Dreams. We all know it's really from Valda though. Valda says the company has closed down. Lou is pleased they're all even (him, Carmella and Valda) – no gains and no losses. Rosie has arrived to Carmella's crisis, which isn't a crisis at all. She had major cravings and she ordered too much dessert. Rosie does a disappointed “Carmella!” as she also recognises that this isn't a crisis. Carmella uses emotional blackmail – saying that she's lonely and needs to be with someone that loved her. However Rosie says that she's in the middle of a disaster with Toadie which she has created. It can't have put her off her food though because eventually she gives in and eats some chocolate fudge cake thing (it looks really good!). Didge knocks on the door and asks Susan (who is stretching her hand out) if she's busy. Susan tells her to come in Susan says the Didge was very brave today in class – her classmates, and Susan herself, will never forget it. Didge explains that she wrote something before the accident that she wants to read to Susan. At this point Miranda appears at the doorway and look on. Throughout this Susan is looking very humbled and raises her eyebrows in the places where she should. TearySusan™ looks up, surprised and teary. She hardly manages to get her words out. Didge nods and gives her the letter to keep. Susan manages to just about hold herself together enough to thank Didge. Miranda looks on proudly. Karl is waving his demo CD at Zeke and Harold talking about ‘Triple E' radio who are trying to uncover exciting new talent. HAROLD: We're still talking about you? KARL: This song contest could be my big break. He admits that some of his stuff may be outdated – but it's a thrilling back catalogue! Indeed it is. Susan is listening in and joins the conversation – she asks him not to enter River of the Soul. He says he's adapted a song dedicated to his wife's courage and is she feeling guilty? She says she isn't. As Karl walks past her she calls him back and tells him that she loves him and they kiss. She wishes him good luck. Zeke asks Susan if it's OK having Bridget at school – which, smiling, she replies it is. Riley asks Didge how school was and she says it was alright. Steve is worried that it was only alright. Didge goes to lie down and Riley takes pouch through to Didge's room. Steve asks what she said in the car. They get round to Susan and Miranda says she saw them talking. Miranda looks upset and Steve comes to stand near her – asking what's wrong. Miranda says she feels so ashamed and she has to tell Susan that she's sorry. Toadie and Rosie have come to visit and Susan gets the feeling it's not good news. Toadie says Catherine quit and both Rosie and Toadie take the blame for not pulling their head in. Zeke jumps to Susan's defence and gets angry at Toadie – however Susan calms him down. Susan tells Toadie to forget all the other barristers – she wants him to represent her. TOADIE: We've already been through this Susan – I care about what happens to you way too much! SUSAN: Oh and that's supposed to put me off? Rosie apologises for making Toadie see the problems with representing her in the first place. Susan says that she'll be the one to make him see it's the only answer. SUSAN: Toadie you know the case better than anyone, you know me better with anyone and I would trust you with my life. He reluctantly agrees and Susan hugs him.